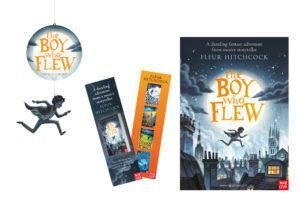 Boy Who Flew POS Packs – Bounce Sales & Marketing Ltd.
Books will fly off the shelves with this POS pack celebrating the launch of Fleur Hitchcock’s The Boy Who Flew. Celebrate the release of a fantastical new adventure from renowned author Fleur Hitchcock, the Queen of ‘thrillers for beginners’, with this in-store POS pack. Includes A3 poster, bookmark pack and hanging mobile.